Not too long ago, we sang that hymn in church. Written in 1874 by Frances Ridley Havergal, it’s brought comfort and focus to generations of believers. What sort of woman wrote such a powerful hymn? Frances was the last child of the vicar of the Anglican Church in Astley, Worcestershire, England, born in 1836. She was always “delicate” (sickly or weak in Victorian-speak). From age seven, Frances was busy putting pen to paper—she wrote poems, lyrics, and encouraging letters. As she grew, she wanted to pursue publication, but her doctor insisted her health was too tenuous for something so physically and emotionally demanding. He then told her she must choose between writing and staying alive. No doubt she was disappointed to set aside her dream, but ill-health didn't prevent her from remaining in active service to God. She still wrote—devotionals, essays, songs and poems—but she also visited shut-ins and taught Sunday school. Frances kept a permanent record of her students so she could continue to pray for them. How many of us want God’s blessing—or our dreams to come true—now? Too often, we view any period of waiting as a sign of His disfavor, rather than trusting He might be protecting us, preparing us, or working something out in us. Frances’ journey to publication wasn’t simple or straightforward. The American economic crash of 1874 decimated the finances of her U.S. publisher. They held the rights to one of her books, so she couldn't take it elsewhere, despite their inability to publish it. She didn’t receive pay, either, until the company got back on its feet. Two years later, fire damaged the offices of her British publisher. Both her manuscript and the plates of Songs of Grace and Glory were destroyed. She had to re-write it from scratch. I wonder if she curled under a blanket, like I would have done, and cried. Instead, she thanked God and found something to learn from the experience. No matter the state of her health, she continued to write. Among her writing ministries was responding to hundreds letters, something like a Christian, Victorian-era Dear Abby. She encouraged and uplifted her correspondents, reminding them of God’s mercies and faithfulness. When she set down her pen to enter glory in 1879, she went with joy, satisfied not by her accomplishments, but by her relationship with Jesus. Some might have called her life small, unexciting. Yet Frances stands as an example that we don’t have to be astounding in the world’s eyes to be of use to God. She wrote, "Take my life and let it be consecrated, Lord, to Thee," and she meant it. Boy, did He take her life, quiet as it may have been, and used it to His glory. Too often, we turn down ministry opportunities because we’re not Martha Stewart, or seminary-trained theologians, or sitting on a comfy nest egg. Frances puts me to shame for every time I’ve said, “I can’t” when God says, “No, you can't. But I can, and I want to do it through you. If you let Me." Fun Question: What’s your favorite hymn? Serious Question: Are there any ministries you don’t currently do, but would like to try? Frances' memoirs, Kept for the Master's Use, is free on Kindle. Click here. 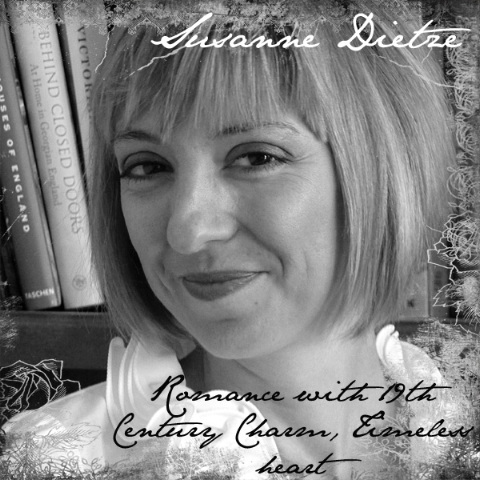 Susanne Dietze has written love stories set in the nineteenth century since she was in high school, casting her friends in the starring roles. Today, she writes in the hope that her historical romances will encourage and entertain others to the glory of God. Married to a pastor and the mom of two, Susanne loves fancy-schmancy tea parties, travel, and spending time with family and friends. Her work has finaled in the Genesis Contest, the Gotcha! Contest, and the Touched By Love Contest. You can visit her on her personal blog, Tea and a Good Book, http://www.susannedietze.blogspot.com/. Our local Christian station does a 'behind the hymn' story once a week. I love them all and am afraid I miss too many. What a sweet story. I had to laugh at the dr's advice that pursuit of publication was too strenuous for her health! I had a sick feeling in my stomach when I read about the destruction of her book/plates. To start over? I'd love to read her story. thanks, Susie! I've seen Havergal's name on hymns, but never knew her story. How interesting that she was a contemporary of another great hymn writer -- Fanny Crosby -- who also had trials. (Crosby was blind.) Humbling too, because it highlights how weak my excuses (I'm too tired, too busy, too...) are. As I read the post, I had to wonder if she didn't curl up and cry first, and then later was able to offer thanks and praise. LOL. That's probably what I would do. We're all human. Pretty amazing, and very inspiring. I have a theory that perhaps she wasn't healed because her greatest work came out of her pain. If she had been healed, perhaps she would have found herself going in another direction and missed out on touching someone's life with her ministry. Even someone today can be inspired and blessed by seeing the great work she did while suffering in her health. Thanks for sharing this, Susie. I'm going to watch the Chris Tomlin video later after work. Favorite hymns: I Need Thee Every Hour and Blessed Assurance. I really appreciated this post. Thanks Susie. Going to add her memoirs to my Kindle in a minute. A great post about another inspiring woman. I also have to wonder if her "delicate" health was the gift that allowed her to spend time in writing--rather than in all the mundanities of caring for her own household. She has truly gifted us with some marvelous hymns and an inspiring example. As to favorite hymn--that's tough. I love so many. One I would frequently ask for in church was "Held in His Mighty Arms." I'm not sure that's my all time favorite, or if it's sung so rarely, I had to ask to be able to hear it. Deb, writing may be sedentary, but boy can it be taxing! (Emotionally, at least.) I wonder what that doctor was thinking. "My dear, just sit and look out this window until you die. Conserve your strength--lifting a pen and thinking too much will deplete your will to live." LOL. I felt the same way when I learned about the book plates. It's hard to imagine having one fragile handwritten copy of something. To have the plates destroyed, well...that's horrifying. We are so blessed to have backup systems, thumb drives, etc. CJ, Havergal counted Fanny Crosby as a good friend! They never met, but they corresponded. I believe they were of great encouragement to one another. I have so many excuses...I'm tired. Stressed. Whatever. But Frances served despite her weakness. I take so much encouragement from stories about faithful saints who weren't (by some definitions) spiritual giants. It's a good reminder that even if I'm weak and my influence is small, God still wants to use me. Oh, that's one of my favorite hymns. Dina, I probably would have done more than curl up and cry. I wouldn't have done much for a few days. Then I would have stressed out over redoing the book. I'm such a stresser. I think you're right, Suzie. What an inspiration Frances is to anyone who is suffering. Back then, it was considered a terrible fate to have been a spinster, too, so Frances could have spent her life feeling sorry for herself. But she didn't. I love that about her. The tune of Chris Tomlin's version is modified a bit from how we sing it in church, but I like it. I love I Need Thee Every Hour, too. It speaks for me some days. Of course, it's true every day! Anita, I'm glad you got something out of Frances' story. I did, too. I found a lot I could relate to--some days I feel useless to God. But look at all He's given me! I have plenty to give back to Him. I may be weak, broken, and sin-weary, but He still wants to use the little I have. No matter the abundance of energy, money, talent, etc, our gifts are God's and He can and will use them. I also love how letter-writing was such a huge part of her ministry. Encouraging others often gets pushed aside in our busy world, but I wish there was more of it going around. Hopefully I can encourage someone today. Encourage someone with an action or word, I mean. Not by this post! Barb, I agree that Frances' health allowed her to be a prayerful, thoughtful, encouraging woman in ways she might not have been if she'd had a "normal" life. I was humbled reading about her Journal of Mercies. Every so often I keep a gratitude journal but I've let it slide lately. Maybe I need to get back to it again. There are so many good hymns, it's hard to choose a favorite, isn't it? I'm glad you like that hymn too, DeAnna! We sing it every so often in church. I love how it's so straight-forward, honest, and clear. ...her doctor insisted her health was too tenuous for something so physically and emotionally demanding. He then told her she must choose between writing and staying alive. Ouch! I believe this goes along with the male Victorian mentality (probably some women, too) that schooling would render women useless for breeding. On second thought, they may have had a point... look at the 3rd world nations where the birth rate is dropping as more women become educated. I am trying to narrow down my list of favorite hymns. "In Christ Alone," "The King of Love My Shepherd Is," "Love Divine All Loves Excelling," "Be Thou My Vision"... Isaac Watts wrote some good ones--ooh, I think I'll write a post on him sometime. But the hymn that always rocks me to my core is "Holy, Holy, Holy." I get chills. My imagination painted Frances' doctor as a small, nervous fellow who thought he was being benevolent by offering that advice. Who knows? Maybe at that time, Frances' priorities were not in line with God's and she put tremendous pressure on herself, which contributed to bouts of anxiety or illness. Maybe part of Frances' time "in the shade" was spent surrendering her desires to God. Or maybe the doctor was completely clueless. I don't know. Still, it's shocking to think how many women were treated during this time in order to preserve their "delicacy." No exercise, no deep thoughts, no wild emotion.